Flushed with Rosy Colour: Elder Uma Dings 80! My druid Uma just dinged level 80, so now I have 5 x 80 toons on Nagrand! For want of something better to do, it's been my plan to level all classes for a while now. The reason is to improve my understanding of all the classes so I can (hopefully) lead raids better. I don't think it's possible to play all classes exceptionally well at the same time, but good raid leaders must have a basic understanding of at least most classes. And of course, I was reminded by one of my kind guildies that 'didn't you get free levels?' referring to the recruit a friend deal David and I did a while back. Isn't it funny that when you do something that might be impressive, there is always someone there to explain how it possibly could have happened? I mean, it couldn't be because I can play well, right? There must be some reasonable explanation! The fact is, after a considerable about of planning together, there was only 5 of my characters that could take advantage of the deal, and they could only get to 60. And the R.A.F deal is a legitimate levelling aid, so it's not like cheating. It means we could plan well together to take full advantage of it, and that's smart gameplay. Sigora, Orc Hunter, 80 - R.A.F. from level 1 duo levelled to 60 with Wolffish, solo levelled from 60 to 80. 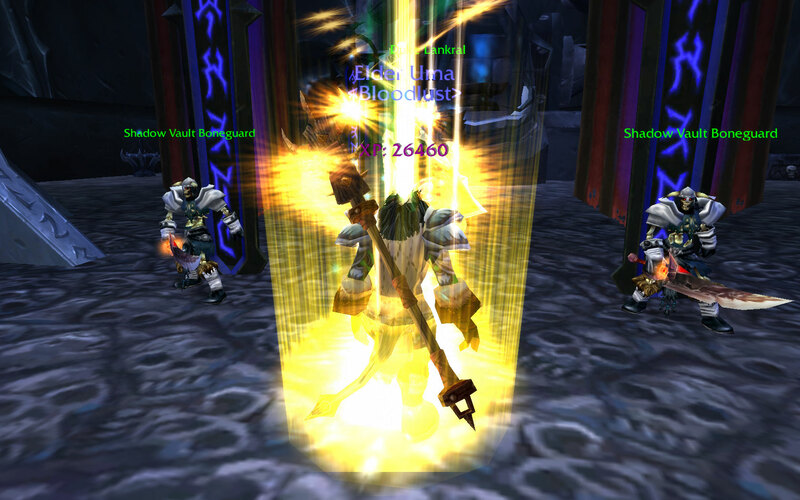 Yulara, Blood Elf Paladin, 80 - duo levelled to mid 20s with Steelle, R.A.F mid 20s to 60 with ?, solo levelled 60 to 80.